This lesion almost always occurs in the pelvis of adult females. There is often associated history of pelvic surgery, endometriosis, or pelvic inflammatory disease. Rare cases have been reported in males. It may present with pelvic pain, as a mass, or be discovered incidentally. It can reach large size and consists of multiple, fluid-filled cysts that may be widely disseminated within the peritoneal cavity engulfing the viscera. 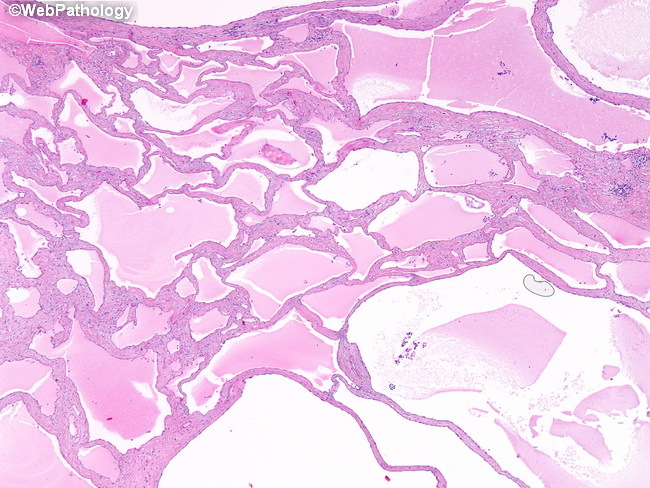 The cysts vary in size and are lined by flattened or cuboidal mesothelial cells.